We now have 6 astronauts aboard the International Space Station (ISS) as 3 new astronauts of Expedition 44 joined the 3 already on board. The Russian Soyuz successfully rendezvoused with ISS just after midnight EDT on 7/23/15. 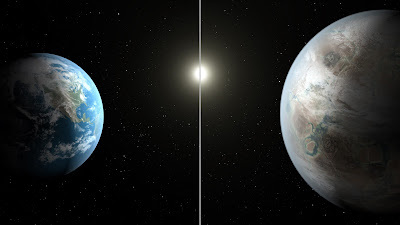 "The newly discovered Kepler-452b is the smallest planet to date discovered orbiting in the habitable zone -- the area around a star where liquid water could pool on the surface of an orbiting planet -- of a G2-type star, like our sun. The confirmation of Kepler-452b brings the total number of confirmed planets to 1,030." What a time we live in - exploring our own solar system and discovering new planets beyond our own system.